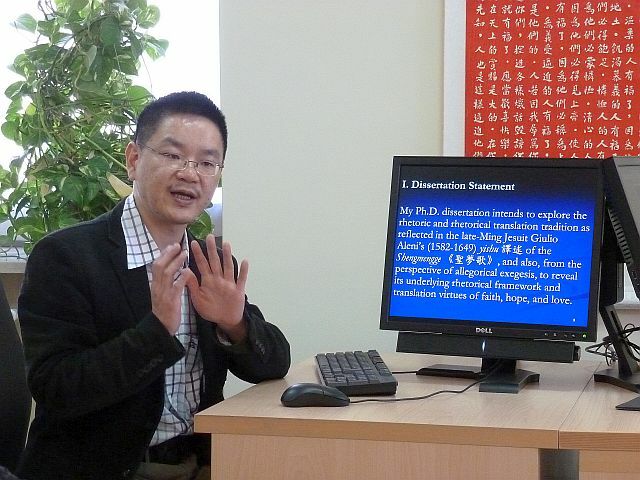 Il 25 maggio 2015, Oliver Wu ha presentato una interessante conferenza presso il Centro Studi Cinesi dal titolo: “Rhetoric and Translation: A Study on Giulio Aleni’s Shengmengge”. Di seguito riportiamo un breve sommario della presentazione e il CV di Oliver. 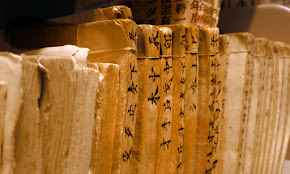 In his presentation, Oliver introduced his Ph.D. dissertation project on the late-Ming Jesuit Giulio Aleni’s (1582-1649) yishu 譯述 of the Shengmengge 《聖夢歌》, a translation based upon the medieval Latin body and soul debate Noctis sub silentio tempore brumali. Oliver distinguished beteen “grammatical translation” and “rhetorical translation,” the latter of which is pervasive throughout the Shengmengge. He also used Roman Jakobson’s (1896-1982) two axes of language (paradigmatic and syntagmatic) to point out the metaphoric and metonymic operations in the translation performance of the Shengmengge. With the fourfould exegesis of Scripture as a model, he demonstrated the dream-debate, demon, and awakening scenes of the Shengmengge correspond respectively, and roughly, to the allegorical, anagogical, and tropological aspects of Christian spirituality as well as the three theological and translation virtues of faith, hope, and love. Oliver Chien-Lin Wu, currently a visiting research fellow at the Sapienza – Università di Roma, is a Ph.D. candidate from the Graduate Institute of Translation and Interpretation, National Taiwan Normal University. His fields of interest include translation theory, translation history, comparative rhetoric, translation and rhetoric, and Jesuit translation in late Ming and early Qing China. He received his master’s degree from the Graduate Institute of Translation and Interpretation Studies, Fu Jen Catholic University, Taiwan. He also has a nine years’ working experience as a full-time legal translator at a Taipei-based law firm of Taiwan and foreign legal affairs.